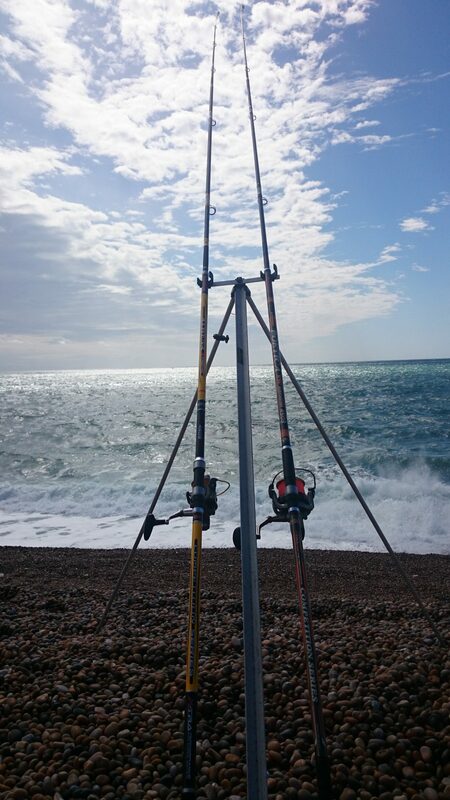 Easterly winds, and clear water meant that the fishing on the Portland end of Chesil was a bit patchy to say the least, but the same conditions made it perfect for fishing Cogden. 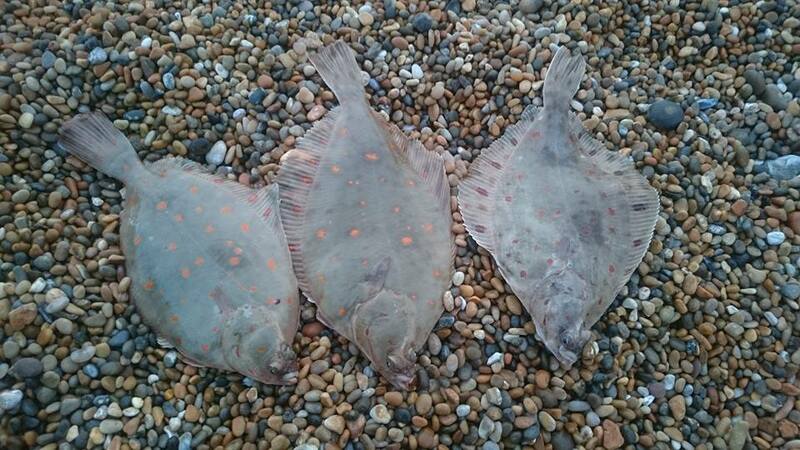 Lots of reports of Plaice from the Western end of Chesil. Cogden does seem to be holding a lot of Plaice this year. The Easterly wind will help get a bait out to distance. A lot of the people I spoke to that were successful this weekend were using continental techniques to help combat the very clear water. So what are continental techniques? Anglers in the Mediterranean are used to fishing in very clear water. They use much lighter tackle than we would normally use from the beaches. Everything is scaled down to try and get wary fish to take a bait. Small baits on small hooks, tied on to flurocarbon hook lengths. Even the swivels used are tiny, and the traces are built using low diameter line of no more than 30lb. The problem is you cant go adding a 5oz. weigh to a 30lb trace and then hope it wont part during your cast. So you need to use long slim rods that are capable of casting 2 or 3 oz. leads a long way. This is why Italian and Spanish tackle companies like Trabucco and Grauvell have been making this type of tackle for years. It is finally being accepted in the UK as the way forward. 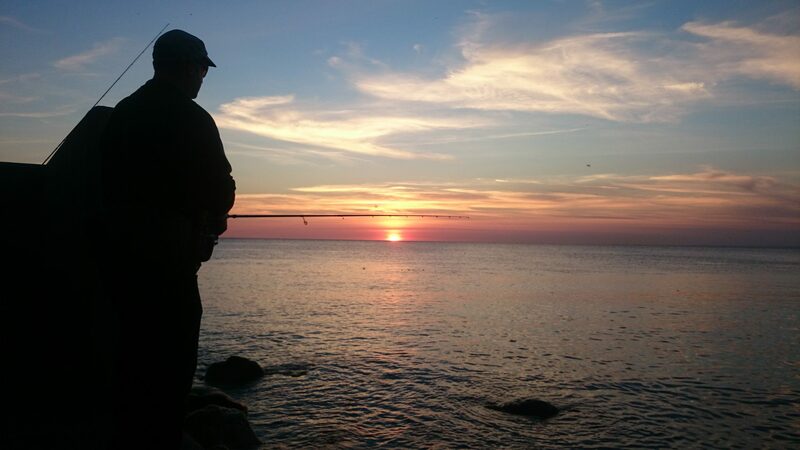 In two or three years you will find most anglers that are looking to buy new rods for spring and summer use will turn away from the traditional UK beachcaster, and buy a continental style rod. 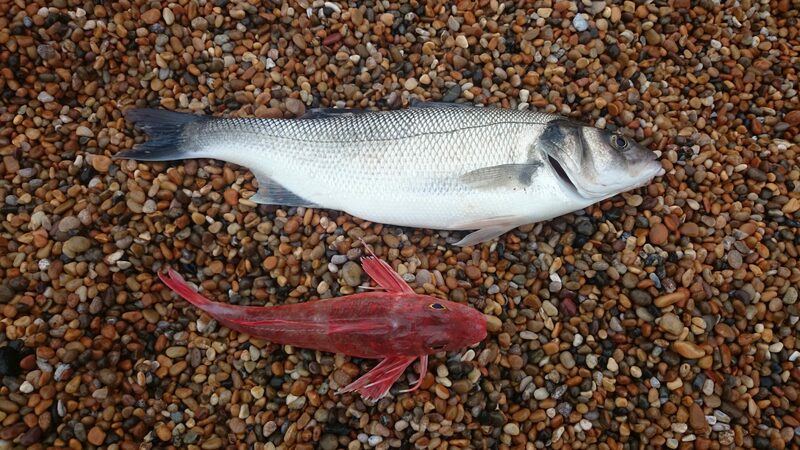 These are exactly the techniques that my mate Gavin used to catch this double shot of Bass and Gurnard recently. I hear a lot of anglers say that Continental rods are no good for rougher autumn and winter fishing, but I have been testing several rods over the past year, and they have more than stood up to rougher conditions. The UK rod manufacturers need to be developing these style of rods if they have any chance of surviving in the future. Chesil Beach forecast: A lot of people have only got Cod on their minds at the moment. Forget about Cod until we have another good SW blow. Myself and Adrian had a quick fish in Chesil Cove last night. Flat calm conditions with a lovely sunset. Perfect for Scad, Pollock Mackerel and Garfish, which were all there in abundance. Fish for what’s around and you will have far better sport. There is also lots of Mullet in the Cove. Further to the West at Cogden and West Bexington it should be a similar story to the weekend, with plenty of Plaice. Most of them are only about a 1lb in weight, but they make a nice meal. Night tides are producing lots and lots of Dogfish and Pout. Portland: The West side will fish very well for Pollock and Wrasse on lures. If you fancy a Conger then the murky water that is on the East side at the moment may well produce. Don’t be surprised to find a big Bass either. Church Ope Cove will be a good spot to try with a big bait in close, if the weed is not too bad. Portland Harbour: This is where I am heading now for a go at Bass on the lure rod. I took a walk down to Castletown and the Marina yesterday, but I was disappointed to see two seals hunting in the area. Weymouth Bay: Not sure if anyone tried the piers this weekend for Squid, as I have not had any reports back. The piers will continue to provide sport with many species including Wrasse, Pollock, Bream and Pout. With an Easterly wind Preston beach should be fishing really well for Bass. 5 Responses to "West is best"
Just a quick note on your mention of the squid – I was down Weymouth last night for a wander and there were a couple blokes fishing at the base of the pleasure pier. According to them there aren’t any about yet (no one was trying though…), but they seemed happy enough catching ‘small flatties’ and a couple of pout! Thanks for that update Matt.maybe a couple of more weeks and we will see them. A good report Sean,Informative and Inspirational. II fished Abbotsbury for the first time ever last Friday , about 400yds from the car park towards the coast guard cottages.walking over the shingle bank I could not believe the amount of fishing rubbish some individual(s) had left on the beach, I counted 15 pairs of rubber gloves also cans, wrappings and paper.